Every now and then I have the good fortune of stumbling across, quite unintentionally, the work of a local artist who stuns me, who blows me away. Whether it’s the result of strolling through a gallery in town, going to an event, or through some other means of happenstance, these “discoveries” often resonate with me for some time. 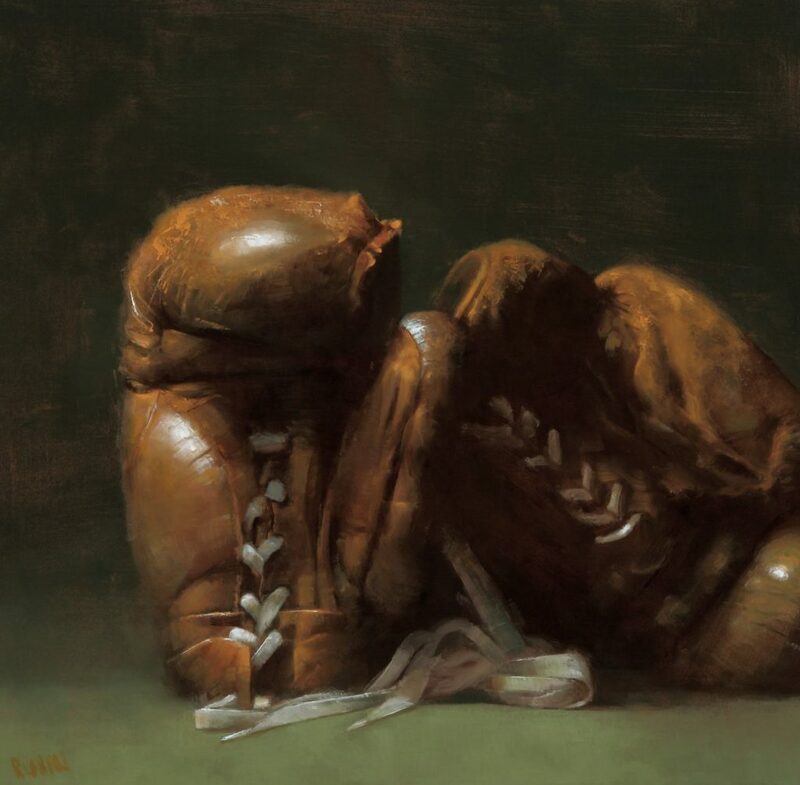 For over a decade, I have been drawn to the art of Marc Rubin, which I first encountered at West End Gallery. And although it took me all those years before I finally met him in person, within moments I realized why his work speaks to me so profoundly. Marc is a storyteller. With my writing, I tend to focus on misfits and outcasts. Marc’s eye for the overlooked goes beyond people, though, focusing instead on the world around us, as he “pulls things from the debris of the world,” as he listens closely to the whispered stories of those things the rest of us often disregard, as he helps them “speak for themselves” by giving them a voice through his paintings. Despite his extraordinary talent, Marc is a very humble man. His role it seems, is to notice and to share and, in doing so, to allow us another chance to notice for ourselves. Once he’s finished a painting, it is no longer his. It becomes part of our story. 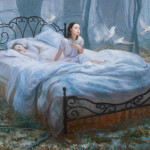 When you first encounter one of his oil paintings, see what story comes to mind. Then visit his other works and see if there might not be another story unfolding, one between the paintings. 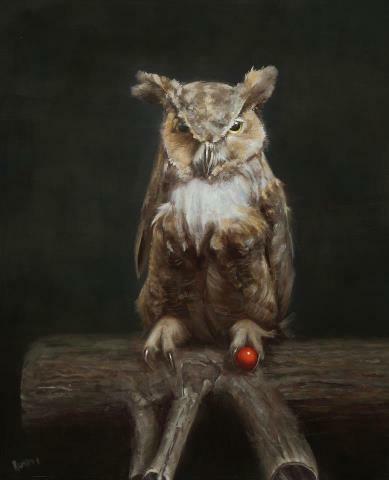 Click on “Spoils,” for example, the painting to the left which Marc has shared as his Other Cool Bird, and follow the red ball back to “Guardian,” “Kinswoman,” “Looter,” and “Shanghai Recollection” – previous paintings in the series. What story comes to mind then? What story will come next? Over the past year or two, Marc has also explored another form of storytelling. Doodles! An inherent activity of the visual artist, it seems, Marc has taken the doodle to new and, at times, satirical heights as a tool for a different kind of storytelling. As a medium through which he comments on the world around us. He focuses on sundry subjects: some cultural, others more on the political side of things. This latest endeavor is, at times, akin to the traditional political cartoon (a form of editorial commentary, of opinion) offering a more subjective and overtly personal storytelling, and it’s seemingly simplistic style adds a level of irony and punch to those commentaries. Whether you share his views or not, there’s something to be said for the authenticity of his choice to use a doodle for this sort of exploration. After all, a doodle is, by definition, “an aimless or casual scribble, design, or sketch; something drawn without thinking about what you are doing; a minor work.” That Marc might explore certain subjects absentmindedly or without consciously thinking of them suggests the deep impact those subjects have on his life, and on his being. And even if he does think about them, the use of the doodle connotes a different mindset and, as a result, a different level of resonance. 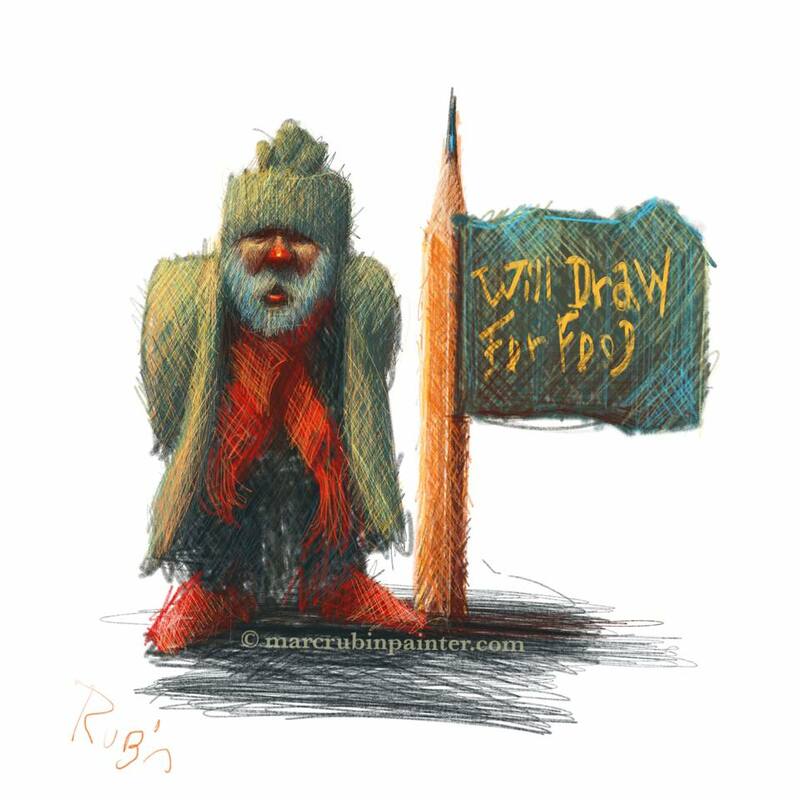 While he has had some of his doodles on display in galleries, it is his paintings that still captivate me most, and to which I still connect most palpably. The way he captures the essence of beauty in the discarded, the forgotten. The way he can illuminate something that has been seemingly used up in such a way that it is perhaps even more valuable, and even more beautiful, than it ever was in its most pristine state. 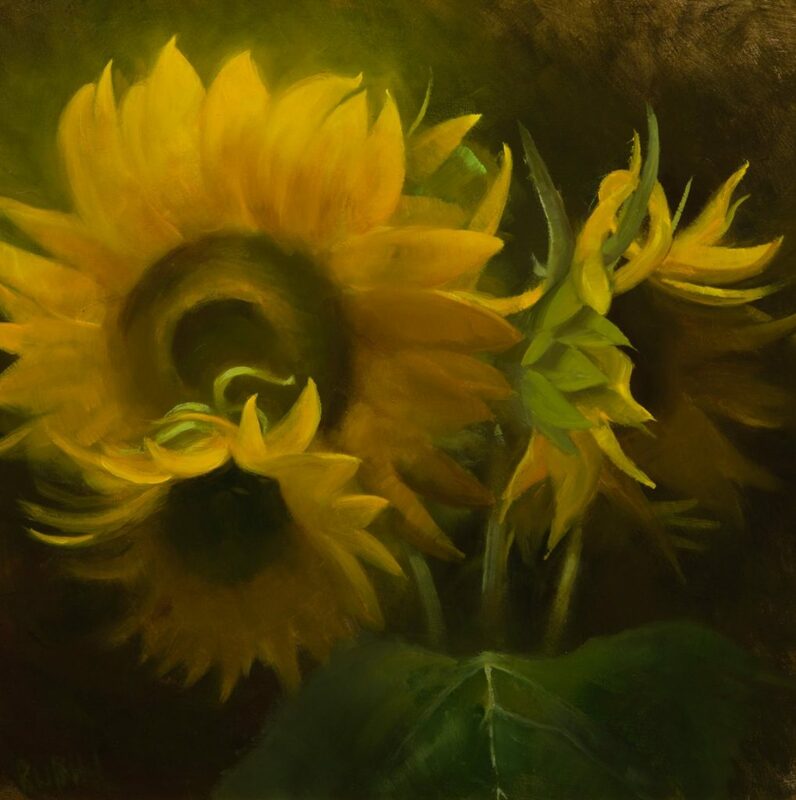 Of course, sometimes Marc observes in his still life paintings the beauty of a thing in bloom, a thriving thing, very much in the midst of life, like his painting of sunflowers below. Whatever his subject, his appreciation of the very things we often take for granted comes through: little things we overlook and big things we sometimes turn away from because they’re almost too much to take. Regardless of the medium Marc uses, he lives a life the reflects Rilke’s comment originally related to writing. Marc Rubin seems commanded to create art, compelled to paint and doodle and explore because the reason behind his doing so has spread its roots into the very depths of his heart. And that might be what I appreciate most of his work. Beyond the expansive talent, or the unique perspective he offers, he is always extending his heart. Take a moment and explore the beautiful paintings on his website. 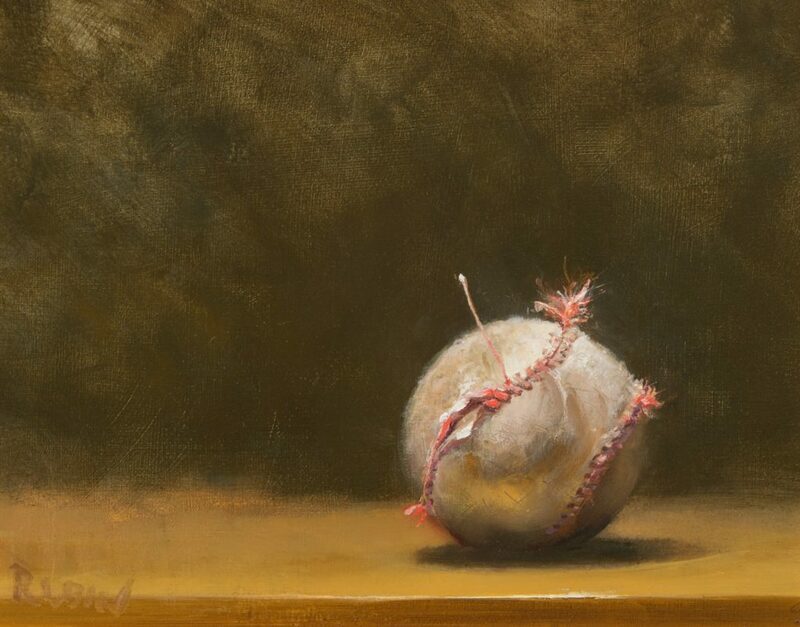 You will also find his paintings and doodles on social media – Twitter, Instagram and Facebook, as well in galleries throughout the country, like Broadmoor Galleries.